Inicio/Spanish Language, SpanishviaSkype/DON’T MISS IT: September promotion on Spanish classes!! DON’T MISS IT: September promotion on Spanish classes!! September seems to be a tough month for most of us because we must get back to work after summer holidays. But, don’t worry! You will be able to keep learning Spanish because SpanishviaSkype has prepared a special offer for you. 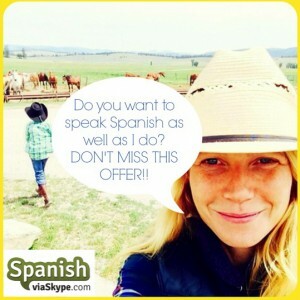 If you want to speak Spanish as American actress Gwyneth Paltrow, don’t miss this promotion!! When she was 15 she spent a year as an exchange student in Talavera de la Reina, Toledo (Spain). Since then, she speaks to her kids, Apple and Moses, in Spanish. 3 – Be willing to learn or improve your Spanish!! Buy one block of 10 classes and get another lesson free! Buy one block of 20 classes and get 2 lessons free! Buy one block of 30 classes and get 3 lessons free! Buy one block of 40 classes and get 4 lessons free! Promotion dates (period to pay for your classes): Sep 1st – Sep 15th (2015).